It did not take for long for England to break the deadlock however, Jess Breach touching down in the 11th minute after collecting a pinpoint cross-field kick from fly-half Katy Daley-Mclean, whose conversion made her the first English woman to pass the landmark of 500 international points. 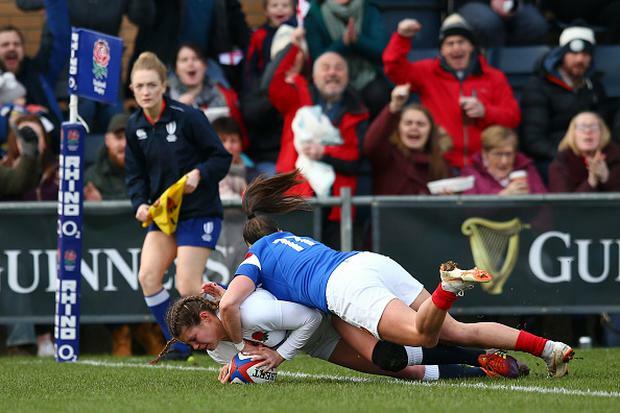 Poppy Cleall then crashed over from close range after winger Kelly Smith had been stopped just short of the line and England increased their lead through Breach's second score despite Vickii Cornborough being shown a yellow card for a high tackle. A frantic start to the second half saw three tries scored in the space of seven minutes, with Safi N'Diaye and the influential Pauline Bourdon scoring for France and Cleall grabbing her second try for the Red Roses. But tries from substitute Hannah Botterman and Cath O'Donnell effectively put the result beyond doubt and late scores from Bourdon and Romane Menager were little consolation for the well-beaten visitors.